Rebecca Russell recalls how she supported an older man who had been lying on the road in Glasgow. She explains she put him in recovering position, kept him talking with the help of his wife and called an ambulance. "He made a good recovery." "At a young age, you could be frightened," she accepts. But with first aid, a young child won't be afraid to go help - even if that just means getting an older person or calling 999, Ms Russell argues. Frances Stewart from St Andrew's First Aid says: "One of the biggest barriers to anyone helping out if someone takes ill on the street is fear." Ms Stewart adds the younger a child is the better and it means they "don't have that fear". "if we can get rid of the fear early on that means it is far easier as they get older." Mr Whittle, who has first foot experience of being bandaged by the 10 year old witnesses, turns to Millie and Ellie joking: "I'm trying to get you back for hurting me so much." The Tory MSP asks if the primary pupils are confident enough to train their fellow pupils. Millie Robinson, a pupil at Parkhead Primary School, explains she has already done a first aid talk to her fellow pupils. "I think they'd learn something from it." Rebecca Russell, who recruits young people for first aid, tells the committee that she and her friend Cara went round local primary and secondary schools. The kids we spoke to were really enthusiastic about first aid and wanted to learn more, she says. "They love it, they absolutely love it." Tory MSP Brian Whittle praises 10 year olds Millie and Ellie for their fantastic demonstration of first aid this morning. "You've made an old man feel much better." Everyone should have a Millie and an Elllie near by, he says. Convener Johann Lamont asks why start at primary school. Colin Peebles from Mearns Primary School says starting earlier is a fantastic idea because at that age their brains are sponges! We start them in nursery school with basic information, like knowing the emergency services, he explains. A young boy who helped save his mother's life is backing a call for basic first aid to be taught in all primary schools. Cayden Mcauley, from Glasgow, was six years old when he used basic training he had been given to aid his mum Lyndsey Baxter after she collapsed in the street. Two years on, he is supporting a public petition from St Andrew's First Aid. His mum said she owes her "hero" son Cayden her life following his actions. Stuart Callison from St Andrew's First Aid says if children and young adults are equipped with first aid skills they will make a huge difference in their communities. Mr Callison calls for quality, age appropriate teaching materials, as well as training and support to enable the teaching of first aid in primary schools. He cites the demonstration carried out by 10 year olds Ellie Meek and Millie Robinson. Mr Callison believes the cost in the first year would be no more than half a million pounds. PE1711 has been brought to the parliament by petitioner Stuart Callison on behalf of St Andrew's First Aid. The Public Petitions Committee will begin by considering PE1711 on First Aid Training for All Primary School Children in Scotland. Ms Lamont says the youngsters demonstrated their first aid skills before the committee, providing one of the best ever starts to business experience by the MSPs. Are these the youngest ever witnesses to give evidence at the Scottish Parliament? Good morning from the Holyrood Live team on Thursday 7 March 2019. First up this morning school children from Parkhead Primary School will give evidence to MSPs about first aid training. They will be joined by representatives from St Andrew's First Aid who, in a petition, are calling for the training to be given to all primary school children. 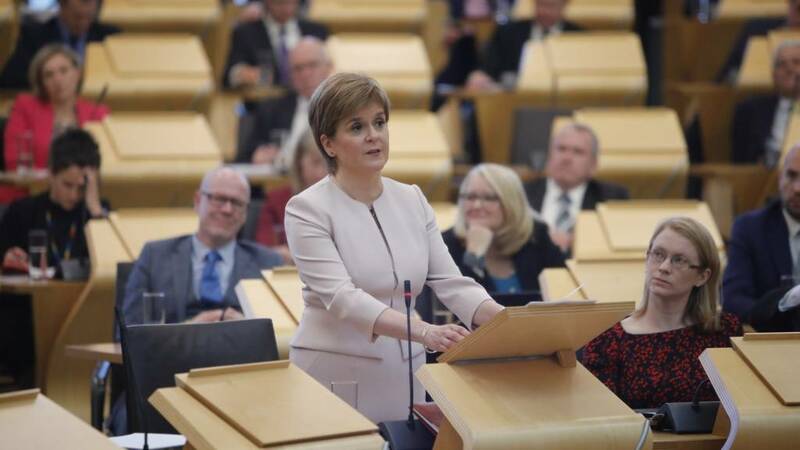 We'll bring you extensive coverage of first minister's questions from noon, after which SNP MSP Annabelle Ewing will lead a debate on the settled status scheme for EU citizens. After a shortened lunch, rural ministers face portfolio questions at 2pm. Then MSPs will debate the Local Government Finance Order, which allocates councils their settlements. Finally the Scottish government will lead a debate to mark International Women's Day 2019.